With the elegance added to its style, the Panerai Luminor GMT goes very well with a formal outfit. The case of the timepiece is shielded with a clear sapphire crystal glass with the back of the case tightly screwed up. 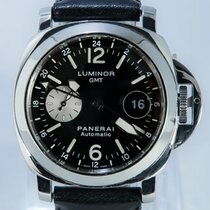 The patent of the Panerai watches, the open/close system locks the crown securing it from waters. 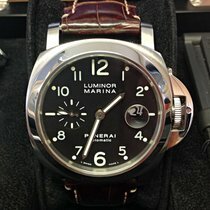 Designed in a stainless steel or a titanium case, the dial size of the Panerai Luminor GMT is very huge. 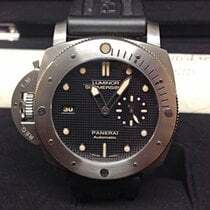 The big dial size is a common feature usually found in the diver’s watches. The dial size is available in two versions-40mm and 44mm. With a water resistance capacity of 300m, it can endure deep water pressures. 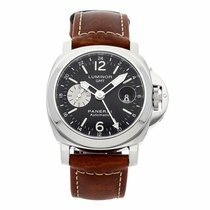 The Panerai Luminor GMT exhibits time in dual time zones making it an added advantage for the travelers. The timepiece is an ultimate accessory for casual outfit as well as graces any formal occasion with an elegant touch. Housed in a stunning titanium case, the Luminor GMT Titanium 44mm Watch is immensely popular holding a special place in the horology world. The timepiece is designed with a massive 44mm diameter size excluding the crown protector which is 15mm in thickness. The skillful craftsmanship of the timepiece is reflected in the titanium bracelet of the watch supported with a stainless steel bezel giving it a stunning look. With a self winding mechanical movement, the timepiece is laced with other technical functions including the date window surfaced at 3’o clock. The movement in the Luminor GMT is COSC certified with the small second sub dial positioned at 9 hours. 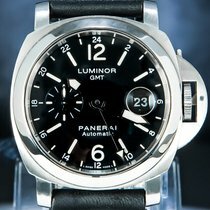 Following the tradition of the Panerai Luminor collection, the Luminor GMT Titanium 44mm Watch carries the legacy of the Luminor designs in an elegant manner. With the bracelet polished with the brush finish, the bezel has been embellished with a mirror polish adding shine to the well polished surface. The Luminor GMT Titanium 44mm Watch houses a power reserve of 42 hours in its store and also incorporates a water resistance capacity up to 300 meters. The bridges of the watch have been designed with the Cotes de Geneve embellishments. Enhancing the aesthetic appeal of the timepiece, the hour markers in the dial have been beautifully engraved with Arabic numerals. Equipped with an anti shock device to resist the external and the internal pressures, it is a perfect timepiece designed for travelers. With a 3.5mm anti reflective sapphire crystal glass shielding the dial surface, a magnifying lens is also placed on the date window at 3’o clock.